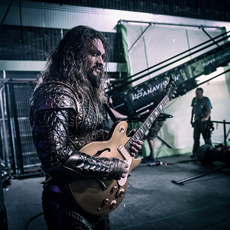 JoBlo posted this picture of Aquaman wielding a guitar on set for Justice League. Aquaman just got even cooler in my eyes! Last week, Blastr confirmed – there will be a fourth Chronicles of Narnia film. Producers are in place and someone is working on the script of The Silver Chair. The first three films made $1.6 billion, so it’s about time they worked on finishing the series. Thanks for letting me stop by your blog, Alex! It’s great to be here! Writing the Self-Help 101 series has been an enjoyable experience. The first novella Self-Help 101 or: How I Learned to Take Over the World Through Tolerating My Family takes place during Christmas. This latest novella Self-Help 101 or: How to Survive a Bombardment With Minimal Injury focuses on the 4th of July. The third novella is coming out late next month. The last one is in the planning stages, and I hope to have it out before the end of the year. After writing these books, I thought it would be fun to share with you some books you can rest assured I will never sit down to write. What self-help book could you never write? Michael Phelps has now won twenty-eight medals, twenty-three of them Gold. That is just mind-blowing. We'll never see another athlete like that in our time. Swimmer Katie Ledecky – they say she is the greatest swimmer right now. The woman beat her own world record for the Gold in the women’s 800m freestyle, coming in ahead of the Silver medalist by twelve seconds. Twelve! Just think how great she’ll be in four years. Our women’s gymnastic team obliterating the competition for the Gold. (They said their team score was the equivalent of a dozen touchdowns ahead.) Then Simone and Aly securing Gold and Silver in the individual all-around was icing on the cake. I still swear those girls have springs in their feet. Swimmer Simone Manuel winning a Gold and breaking the World Record, a historic moment. There are just so few African-American swimmers. Our men’s team is struggling a bit, but our women’s basketball team is killing it and should sweep for the Gold. They also scored over a hundred points in their first three games, the first time any basketball team has done that at the Olympics. Pat Hatt had no book release last week. The writing community was shocked and Amazon’s stocks dropped. The Cat could not be reached for comment. However – Pat has been doing a series poking fun and featuring his blogger buddies. And he got me last week, right down to my own blog post format. Visit Pat Hatt and prepare to be amused! Excited for Rogue One? What about another Narnia movie? What self-help book couldn’t you write? And what highlights of the Olympic games have you enjoyed? I also have been watching the Olympics, we're doing quite well. Another Narnia film? Hadn't heard that. Watching the Olympics here too, amazing athletes and we are doing quite well too! Just checked out Pat's post - hilarious! Chuckles! Self Help titles not to write! Yes, there are matters better not to mess around with. Phelps is just way out of this world. There can never be another like him. And Pat is a daily dose for Hank's amusement of surprises! I have been watching the Olympic as well, swimming is one of my favorite competitions. Phelps is just amazing 28 gold medals. Simone winning the gold was an emotional moment as the world watched her cry tears of joy. Hmm...I wonder what song Aquaman would play? Pat doesn't have a new book, but he is having fun at his nook. I haven't been watching the Olympic games, but I've been keeping up with it a bit online. We do have some amazing athletes. Congratulations to those with book releases and a huge congrats to the winners of your new audio. Aquaman and a guitar, now that could be interesting. Rogue One looks like it's going to be an intense movie. My husband, who dresses as an Imperial gunner for the 501st Legion, was a bit surprised initially when he saw one being blown up in the trailer. There will be a lot of new Imperial and Rebel costumes coming out of this movie, I'm sure! I really liked The Silver Chair (actually loved the whole Narnia series and probably have read it as much as LOTR) so will be looking forward to the movie version. I'll be especially interested to see Puddleglum (I think that was his name, the marsh wiggle that helps Jill and Eustace). Happy Monday! I've been enjoying the same things about the Olympics. Swimming is my favorite. Now that it's done, I probably won't watch as much this week. I've watched some of the Olympics (particularly Bolt last night), but appreciate your update for all the things I've missed! We have been watching the Olympics too, and I especially enjoy the back stories on the athletes because they are so inspiring. Pat has been a hoot this past week! Suzanne, he's a funny guy. Really hope they can finish off the Narnia series. Sandra, I think this one will really showcase Gareth Edwards' talents as a director. Marcy, I wonder if he'll be real or CGI? Elizabeth, you're welcome. And I'm all right with them dumping the orange and green. Deb, the one on the South African runner whose mother couldn't compete was touching. I am delighted there is another Narnia movie on the way. It's about time. I think the original kid from Dawn Treader will be too old now though. There are some more Narnia stories they could make, I wonder if they will. I want to see Pete's Dragon. I think I might be able to drag Matt with me so I don't have to go alone. I haven't seen the Olympics this year but am so inspired by Michael Phelps and all the other athletes. We have been enjoying the olympics as well. We get mostly the rowing and sailing events on free TV and highlights of everything else, unless we pay for sports channels. As for the movies, I love the Narnia series, and am excited for that one. Mrs. Shady and I were on the road yesterday and stopped at a restaurant for brunch. We watched the Rio Olympics on a large monitor and witnessed the awesome spectacle as the U.S. women’s basketball team systematically destroyed Team China on the hardwood, racking up triple digits. Those self-help books look fun! I haven't had time to see one Olympic event. Oh well. Maybe I'll catch them four years from now. The new Star Wars movie looks cool to me! The battle with the AT-AT-s... brr... it looks awesome! Fortunately we've got a very good Olympic team, and I hope our Hungarian Heroes will won another medals in the following days. I love that Jimmy Smits is making a cameo appearance in Rogue One. Love him! The Olympics have been very exciting. Ladecky is amazing, as is Phelps. And I really enjoyed seeing Michelle Carter win the gold for Shot Put! Have a great week Alex! Nice to see L.G. here. Wishing her well with her series! We're enjoying the Olympics too. I'd forgotten how many sports are included, like badminton and ping pong too. Thanks for all the news and links. Have a great week! I'm thrilled to be a winner, Alex! Thanks. Had to giggle at L.G. Keltner's self-help series. I've been watching some of Olympics. I was thrilled to watch Simone win a gold in the vault, first American woman to do so... and to see Usain Bolt win his third gold for the 100m. First time for that too. Way to go Jamaica! I love the whole concept behind L.G. 's self-help novellas. What a great idea! I just watched it. I'm singing and dancing. Congrats everyone on win and Alex on audio release. Congrats all on book releases too. Not really watching the Olympic's this year. I've not intentionally watched any of the Olympics, but sometimes it's been on when I've been someplace so I've been drawn to watch parts of it for short periods. I was impressed by the whitewater course they had set up for kayaking (or whatever it was). L.G. 's self help series is a clever idea. So many people enjoy self help books so why not use it for a fiction idea. Maybe the self help book I couldn't write would be one about watching sporting events on television. Actually come to think of it I could probably come up with some entertaining ideas on that concept, some inspired by personal experience. Self-Help 101 or How to Operate at a Snail's Pace. LOL, I'll never write that one. I loved seeing the 41-year-old gymnist. My body would've said no way. My favourite Olympic moment has to be when homegrown athlete Wayde Van Niekerk broke Michael Johnson's 17-year-old world record in the 400m track event on Sunday night. Van Niekerk finished in 43.03 seconds... 0.15 seconds faster than Johnson in 1999. Wayde became the first South African to win an Olympic gold medal on the track since 1928! The synchronised diving has also been great! I've been enjoying watching the Olympics. Especially swimming and women's gymnastics. Our athletes are amazing! I'm happy for all of the athletes. Wow. I could never do Self Help on any athletic events - can't jump, no eye hand coordination, and I give up easily. I don't want to get hurt. Funny comment on Pat Hatt's lack of publishing this week - he's slacking that's for sure. (!). Row row row your boat, Alex. Do five minutes worth for me please. Congrats, L.G.! I've been peeking at the Olympics now and then, but my husband keeps me informed on most of it. Lol! Fashion books wouldn't be my forte (clothes, makeup and such). Congrats to Jess and Bish too! My children were just the right age to enjoy the earlier Narnia movies so we'll see about this one. The Olympics have been awesome. I couldn't write a self-help book about stopping the coffee habit. Well, actually, I don't want to. I'm so proud of our U.S. athletes. And those gold medals are huge symbols for our nation and the kind of young people we are privileged to boast about. Congrats to Jess and Bish on winning your book. Sad to say, I still haven't read the Narnia books. JO, they'll have to find a new Eustace. Shady, they really took them to the cleaners. Juneta, I think you're excited! Michelle, that was a great race. Joanne, I'll do a whole thirty minutes for you. Yup, Aquaman just got cooler! Those are hilarious Self-Help books, L.G. I wouldn't be able to write that social situation one either. Maybe: Self-Help 101 or How to Quit Eating So Many Cookies. Okay, I couldn't even type that without laughing! I haven't seen too much of the Olympics, but I've been hearing a lot about how hard of a time the athletes have been having in Rio. Yikes! We've been enjoying the Olympics, but it seems to me that there are many empty seats in many of the venues so I'm wondering how successful these Olympics are. Awesome self help books. A book I wouldn't be able to write: How to Control Yourself in Social Situations and Not Say That F**ked Up Joke That'll Surely Offend Everyone. And your news on Pat Hatt made me laugh out loud. Should someone go check on him? Make sure he's not sick and/or dying? I love the Narnia movies! I am looking forward to the Star wars movie. I hope the bad boy, aka Han Solo"s and Leia's son doesn't get lippy:) I'm sorry but in 3D I always kept looking at those huge lips on that actor. I could never write a book as to why I spend time watching and enjoying movies and making cards/scrapbooks. I would lose my cool and get really snarky...which i have. I laughed out loud at your comment on Patt's lack of a book this week:) So that is Ultraman? I was still expecting a pretty blond boy in a green outfit. The Americans are killing it at the Olympics which is not surprising. I'm happy with our 13 medals but i have not watched much at all. I do like the Equestrian and the kayaking down the rapids. When is that coming?? Karen-It's nice to see you here too, and thank you! Bish Denham-I'm glad to hear it. I'd hoped this series would inspire a giggle or two. Arlee Bird-It's amazing how many possible self-help books you can think of. L. Diane Wolfe-I love it! T. Drecker-I couldn't write fashion books, either. Christine Rains-Yeah, I don't think the cookie one would work well for me either. A Beer For the Shower-I wouldn't be able to write that one either, but I think it would be a fun one to read if anyone did write it! I've more been watching the Olympics as background noise. So much filler in the broadcasts. But exciting moments, too. Those were some pretty funny self-help titles. I don't think I could top them. I don't have a TV, so I haven't really seen any of the Olympics this year, which is a bit of a shame. Looking forward to checking out Elizabeth Craig's new book. I've enjoyed her previous ones. Have a great week! I've been enjoying GB nipping at the US's heels in the medals table and breaking records all over the place. Max Whitlock winning two Golds for gymnastics in one day was quite a moment and diving and indoor cycling have been great too. I love how there is always something different to watch. L.G. 's self-help books she could never write were amusing - I think my list would be endless! L.G. after careful consideration, I think you must write those self-help series. I really need to quit caffeine and I hate the thought of kicking anyone. Plus, how do you stay calm when someone says S/F is stupid? Especially is you're off caffeine??? Well, the movie is doing horribly with test audiences, and it's because Disney chose a director based on hype rather than skill. L.G. 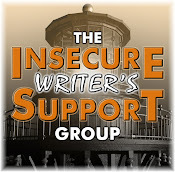 Keltner's guest post is hilarious - love her self-help series! Brandon and Bryan, I know! Something must be wrong. Birgit, I don't know. And go ahead and be snarky. Spacer Guy, that would be challenging. Tyrean, I've liked the casting choices, they just botched Prince Caspian's storyline. Roland, it looks like it might even be better. Andrew, I checked the rumor - it's false. There was no test screening. The reshoots were expected. Alex, I implore you to work that humor angle more often. It's exceptionally good, and there's not enough humor in the world or blogland. "Amazon's stocks dropped" because Pat Hatt DIDN'T release another book. Wait, maybe you were being serious. It's probably true. Woo Hoo, Alex. Let's here it for Relaxation Day. Grin. Way to go, L.G.! We can all sure use self-help! Love the Self-Help ideas, congratulations, Laura! Pat didn't release a book? Wow! But he did submit for the WEP challenge! Way to go Pat! I've missed most of the Olympics, but enjoy the clips I see here and there. The Fencing finals had a hilarious jumping close. I'm not surprised at all to see Simone medal - her routine in the qualifiers was simply unbeatable. I'm excited that the Chronicles of Narnia is getting another chance. The one I'm most excited to see is the Magician's Nephew, which is still a ways off if they are diving into "The Silver Chair." Loved the Narnia books. Not certain about their translation to the big screen. Another Self-Help 101 book? Consider me smiling broadly. I guzzled the first. I can't wait for Rogue One. I really like what Disney has been doing with Star Wars. It's been a while since I've been this excited for a movie. So many great things happening at the Olympics this year. It's awesome and fun to watch. I'm excited about the possibility of another Narnia movie. My kids were really disappointed that they quite making them. I've been just watching what I can online of the Olympics and really enjoying the fencing. I loved the Self-Help post--hilarious! Watching the Olympics has been great fun. The contestants seem to care for each other so much. They cheer and hug when teammates do well. Very inspirational. The gymnastics are my favorite, then the swimming. Nick Wilford-Mine is endless too, but for the sake of today's post, I had to limit myself to a few. Joylene-Staying calm about such statements while off caffeine would be impossible. I'm not sure any self-help book could make that happen. Elephant's Child-I'm glad to hear it! Jenni-I'm glad you enjoyed it! When I try to write something funny, I always wonder whether I pulled it off or not! The Self-Help book I can't ever seem to write is knowing when to quit doing something I am doing. Crazy stuff like that. As far as the Chronicles go, I adored CS Lewis and need to go see where he left off when he wrote the series. That could be interesting. I was wondering the other day if they were ever going to finish the Narnia series. I'm mostly waiting for The Horse and His Boy. That was my favorite as a child. L.G. and my dad would have a very awkward conversation if she brought up sci-fi to him. He's be polite but he hates it. Supernatural/Paranormal even more. Just stick to action and thrillers and it would be good. I'm okay with a Silver Chair movie but damn did they sit on this a while. Rogue One trailer was really good though I didn't feel there was any particular stand out moments that made me go wow. Still really good and I did like the robot's quips. Also a quick hi from that good ol' siren almost everyone but me hated in the teaser. It's an emergency people, let your ears pop for five seconds and deal with it! Loved it. I'm strange. Congrats to the winners and Pat is a hoot. Pat for U.S. President! Watching the Olympics is amazing. I am in awe of the athlete's abilities. Robyn, I will do what I can! Michael, I hope they get all the way through the series. Sheena-kay, I'm all right with the wait for the payoff. I'm so Star Wars sentimental, I tear up when I watch the Rogue One trailer. Sappy, I know. I'd heard about The Silver Chair years ago. I wondered what happened. Hooray it's a go. Olympics are great. More stories behind the scenes need to be on display. It's not always about the gold, but yes, the USA is top dog all the way around. So disappointed in the women's soccer team's outcome. But you can't win them all and can certainly do that with a bit more class. I like those would-be self-help books. A title I couldn't write would be How to Be Super-Organized. I take after my maternal grandmother in how laid-back and disorganized I am, though there's a method behind the madness. Jean-I can relate to that. Sheena-kay Graham-I have family members who feel the same way. Carrie-Anne-I also couldn't write a self-help book about being super organized. I wish I could. L.G. 's novellas sound like funny delights--and painfully real for some of us! The Olympics are, as usual, so inspiring and humbling to watch. I've decided that Phelps is an alien from another dimension. Just can't be human. And the women's gymnastics team are equally unreal. That's what the human body is capable of doing? Wow. You are so right about Michael Phelps. I'm so glad that that little bit of trouble you got into has just died down and swept under the rug. Come on people get with the program. So he took a hit big freakin' deal and tell me who says they don't or never did and I'll call them a liar or something is wrong with them. Me... sure I took a few hits in my early 20's and got sick as a dog for three days and I slept for those three days! Now... I can smell that stuff a mile away. bwahahaha But what a swimmer... what a super athlete! And I hear he's a real family man too! How wonderful is that... maybe jr. will follow in his daddy's footsteps! One could only hope. Michael Phelps is simply amazing, one of the best sports figure of all times. I don't think I'm capable of writing a self-help book. Like the book cover for Cruising for Murder as well as the title. My family and I have been enjoying the Olympics. Some events do come up at awkward times in South Africa though, like 2.am. Congrats to L.G. and Elizabeth. Also, a big congrats to the winners of the CassaStar audiobook. I'm sure they will enjoy it. Keep well, Alex. Leslie, it stalled because Dawn Treader didn't make a ton of money. Helena, maybe he is an alien...? Marie, he was just young and stupid. And I have never smoked or taken illegal drugs - for real. Murees, some of them are really late here as well. To watch as much as I wanted but did enjoy the track and also some of the swimming. What? Pat has no new book??? The sky is falling! I have been watching the Olympics, and I love the diving. My inner Canadian comes out though. I enjoy watching the athletes who come and perform knowing they never have a chance, but their win was being at the Olympics. Finally saw the latest Star Trek ~ great fun! Your non-book titles were lots of fun, L.G. I've had way too many people tell me science fiction was stupid. I "retaliated" by making sure I read a lot of science fiction aloud to my third graders. Do you have a favorite scfi novel or series? Those Self-Help 101 titles are LOL funny. I believe you can remain calm while vaporizing someone with a laser pistol. (I'm sure Dirty Harry could do it if he were in a SF film.) Haven't watched any of the Olympics. I'm always excited for new Star Wars movies. This one looks pretty cool. 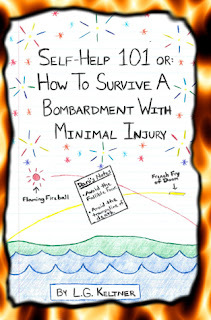 I don't think I could write Self-help 101: How not to worry. It's kinda what I do. I enjoyed watching Phelps swim and win is last race. I also enjoyed watching Bolt make history. All the games have been pretty good. How to Speak in Any Social Situation. Couldn't write it, but I would be tempted to read it if anyone else is willing to give it a go. How about Giving up chocolate for more than three days? Nope, can't write that either. I would love to see another Narnia tale. I'd also like to see Pat Hatt take you on. So I will. Toodles. Wait, no new Pat Hatt book? What is this insanity you speak of? Our Olympians are doing a fantastic job! Erika-Glad to know I'm not the only one! Fundy Blue-That's a great way to retaliate! I'll read pretty much anything sci-fi, though I grew up reading a lot of Heinlein and Asimov. Jeff-I'll be sure to keep my laser pistol on me at all times, then! Toinette-I tend to worry too. I've gotten better over the years, but probably not enough to write that self-help book either. Tamara-I wish someone would write that book, because I could use it too! Congrats to Elizabeth and you Alex on your wonderful releases. I'm glad to hear science-fiction gets picked on, too. Romance always has people saying the dumbest things...usually they're people who don't even read within those genres. I think ANYTHING that gets people excited about reading is a good thing! Rosey, you could get him good. Fundy, glad you saw Star Trek. Jeff, I bet he could! Shannon, it's insane! And what a comment. I couldn't write Self Help 101- How To Improve your Sense of Direction (without GPS). I need an onboard GPS for my brain. As for the Olympics, Canada's women teams have done much better than our men teams as well. I don't have time to watch it all, I just catch highlights. It's been a busy summer and Vancouver has had great weather. I'm trying to fit writing back into my schedule, but it's not easy with caregiving taking up most of my day.Thanks for stopping by to read my WEP entry! What's your thoughts on New Rogue One, Alex? Glad they're making another Narnia--hopefully they' keep Liam Neeson as Aslan--perfect fit. Nice to see L.G guesting on your site, Alex. Nothing like a bit of Self-Help 101. I would never write a self-help book for a dog. The Rio Olympics and there are a lot of people disguised as empty seats. Still, the USA is doing very well. The UK is doing very well. If you don't win the gold in Basketball, despite it being invented by a Canadian, there should be an inquiry. Oh, LG's book sounds like fun. We enjoyed the synchronized swimming the other afternoon at work. I watch a women's rugby game for the first time from Rio. It was fascinating. Those women are tough! Self help book I couldn't write - How to stay on task when my Red Sox are on TV. I haven't been watching the Olympics, but I read news about it. I'll check out L.G. 's Amazon page. I saw Suicide Squad and Ghostbusters this week.Talk about visual overload. We usually have the TV turned on to the Olympics, but most of the time it's just background noise for us. After a while it seems like they run the same races over and over again. I sometimes watch the Olympics on CBC. The Canadian station shows a wider variety of sports. Another Narnia movie is definitely needed. High quality fantasy movies are always appreciated. L. G had me in stitches. GREAT feature. THANKS L.G. I couldn't write a self help book on keeping your advice to yourself when going into a poorly designed space. Haven't caught much of the Olympics.... I prefer the winter over the summer. How fun that Pat featured you.. must check it out! We've been watching the Olympics, too. We didn't get to see any shooting or archery competitions before they wrapped up. I don't understand how they can have 15 channels of Olympics, but I can't watch the sports I like unless I stream them on my computer in the middle of the night! Looking forward to more Star Wars as long as they leave Jar Jar out! Lochte is certainly making a name for himself. That Self Help book about the social situations is one I couldn't write either. I'm awkward in person. There is a reason I'm a writer and not a speaker. LOL! I've been loving the Olympics, although I wish they aired more of the events. Yeah, I know they're online, but I can't stream at home. Heh. I'm obsessed with the Olympics. Such amazing athletes! Wow! I agree we will never see another athlete close to Michael Phelps in our lifetime- just crazy amazing skills. So cool to watch. I love it all. Yeah, but did they ever get that "fish smell" out of Aquaman? I could not write a book about writing a self help book, lol. Hmm, the Cat has not been silent after all. (had to pick myself off the floor to write that comment.) I'm watching the Olympics too and marveling at such talent. Go Women's teams USA. The Rogue One trailer does look good. Hubby and #1 son are particularly excited. Well, I did write a self-help memoir and don't think I'll tackle that genre again. It was HARD. We watched the Olympics off and on. Seems like whenever I turned on the TV it was men's weight lifting, which has to be the most boring sport ever. I did get to see quite a bit of diving though, and that's beautiful. Jimmy Smits is a hunk. HOT. The Olympics has been nothing short of amazing. Is that Jason Momoa as Aquaman? So cool even though he will always be Khal Drogo to me. So many amazing stories over the course of these Olympics! Wait... No Pat Hatt book this week? Stop the presses! Social awkwardness is my middle name, except when I'm not surrounded by backstabbing office politicians. I came by several days ago (via my phone), but commenting is a real chore using that thing. I meant to drop by sooner to leave a comment. I haven't seen much of the Olympics having been at camp. What I have seen has been pretty amazing. Of course, there has also been the disappointing in the form of the boys who made up the fake robbery story. What were they thinking???? Ah well. 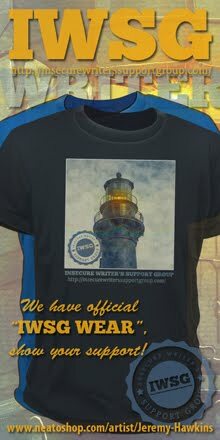 As for my IWSG post... yes, I might just need you to put that together for me. hahahaha. DG, our women's teams are also doing much better. Sandra, I think it will be great. I really like the director. Melanie, he was a perfect fit. Gary, our women's team has it for sure. Sandra, not a good one! Keith, that will be your first trip back, won't it? Karen, how did you like the green water? Hi Alex! I hope you're enjoying your summer. I'm in and out of my blog for now. I'm so exhausted after a whirlwind summer. In addition to classes, I just went to Surf City a few weeks ago. Whew! I am very excited about Rogue One. I had no idea Jimmy Smits was back. I haven't seen him forever. So is Rogue One a prequel to the original films...but set after the prequels? That's the new Aquaman? He reminds me of the guy from Stargate: Atlantis. 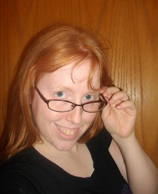 I enjoyed Laura's guest post, especially the funny things she'd never write! Wishing her great success! There wasn't too much o the Olympics here except for those venues Egyptians entered in - those were things like weighlifting and judo. Sadly, no coverage of the swimming or the gymnastics (which is my favorite part). Congrats to Elizabeth on her release and to Jess & Bish for winning your audiobook! I'm not normally an Olympics person, but I've been really inspired by Simone Biles and her story. She's a fascinating young woman. And of course, Usain Bolt. There's a guy with springs on his feet. He shouldn't be able to do what he does, but he does it anyway. I wouldn't be able to write a self-help book about saying the right thing in social situations, either. My attempts at such would probably be even more disastrous than L.G. 's, haha. Congrats to her on her latest release! Rogue One looks intriguing! Silver Chair might be okay. I read the book so long ago I don't remember that much about it. Time for a re-read. We've been enjoying the Olympics, too. The athletes' feats are mind-boggling. The gymnastics are some of my favorite events. I wish I had half their energy. Much success with selling your book. Love your last name. Great name. Robin, that swimmer is just an idiot. MsMariah, I think it takes place just before Star Wars. Lexa, that's because it is the guy from Stargate: Atlantis. JH, he has nine Gold medals in three Olympics - very impressive. I'm up for another Narnia movie. Have a great Sunday, Alex. And I haven't been following the Olympics, but it's been great to see so much attention on the woman athletes. Sports is so, so often focused on the men, so it's great to see that changing, especially when the women are doing so well. Due to travelling I haven't seen any of the Olympics - wouldn't have watched much anyway though. I have nothing against sport, but there are things I'd rather do than sit in front of the TV. I haven't seen any of the Olympics.